Neem Tablets are very effective in treating skin related allergies. 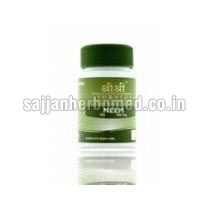 We specialize in offering Ayurvedic Neem Tablets that are known for causing no side effects and high efficacy. These tablets are enriched with the goodness of Neem. They purify blood and blemishes. Also, these tablets improve liver function and are effective in treatment of obesity & diabetes. We make available Neem Tablets in a pack of 60 tablets at reasonable prices.